Near-death survivor Ian McCormack talks about his amazing life PLUS win the chance to meet him! His life story makes for fascinating reading. Former atheist and now minister Ian McCormack (58) had an incredible journey that transformed his wild, crazy life and altered his life's path. PLUS: Win a chance to meet with him! His life story makes for fascinating reading. Former atheist and now minister Ian McCormack (58) had an incredible journey that transformed his wild, crazy life and altered his life's path. He surfed his way through the world, starting at home in New Zealand before landing in Mauritius. Along the way he was stung by five deadly box jellyfish on a late night fishing expedition and rushed to the hospital. He was pronounced dead but 15 minutes later woke up saying God had spared his life. Little wonder his tale has now been made into a movie The Perfect Wave starring Clint Eastwood's son Scott and directed by Cape Town director Bruce McDonald. We caught up with Ian. What were your thoughts when you first heard the idea for the movie? I thought it would be great! I'd been travelling around the world telling my story and preaching and it seemed like the perfect way to take it further. And Bruce just seemed like the right person for the job. He contacted me via my website and got the ball rolling. How involved were you in the filming process? Quite a reasonable amount at the beginning. But of course while this is story or a reasonable interpretation of it, I had to let the experts do their job. I've seen the finished product already and well, I'm biased when I say it's a great job. You've got a love affair with South Africa, tell us about it? I lived in Cape Town in the 1980s for a little while and made quite a few friends who I've come back to visit from time to time. I lived in Jeffreys Bay and Bantry Bay and on my last visit, spent some time in Bantry Bay. I surfed there quite a bit and also down in Durban. I do love it here! You've been travelling around the world for 30 years telling your story. What have been some of your most memorable trips? Going back to Mauritius is definitely up there. 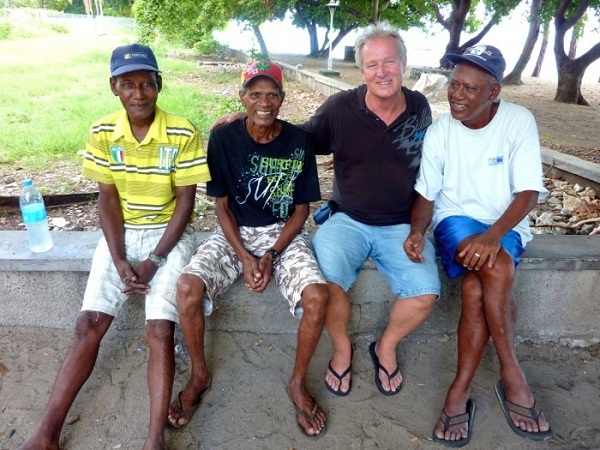 I spent some time with the Creole fishermen who were there the day I was stung and rushed to hospital. It was so fascinating to speak to them and hear them recount what happened. It was special too. If there's one thing you wish this movie would achieve or teach others, what would it be? That there's life after death. For me it meant a personal relationship with God - one I never had before. What’s your idea of true happiness? When I was younger it used to be travelling and surfing. These days it's leading a spiritual life and feeling so much of love. We're giving away prizes to five lucky winners. The main prize of a one on one lunch meeting with Ian (to take place on Monday, 24 February) comes with one of his devotional books, Heaven, Hell and the Box Jellyfish, and chat with the man himself. The lunch takes place in Sandton and travel costs are for the winner's account. Two winners will win Billabong hampers worth R1 000 each plus the Christian Surfers Bible and a devotional book. Another two winners will win a devotional book each plus double tickets to see the movie at their nearest cinema. All you have to do is SMS your name and contact details plus the answer to the question below to 34923. What is the name of the movie based on Ian’s life? Competition closes 21 February at 4pm.